THE CONVERSION OF JONAH “Now the Lord had prepared a great fish to swallow Jonah. And Jonah was in the belly of the fish three days and three nights. Then Jonah prayed to the Lord his God from the fish’s belly. 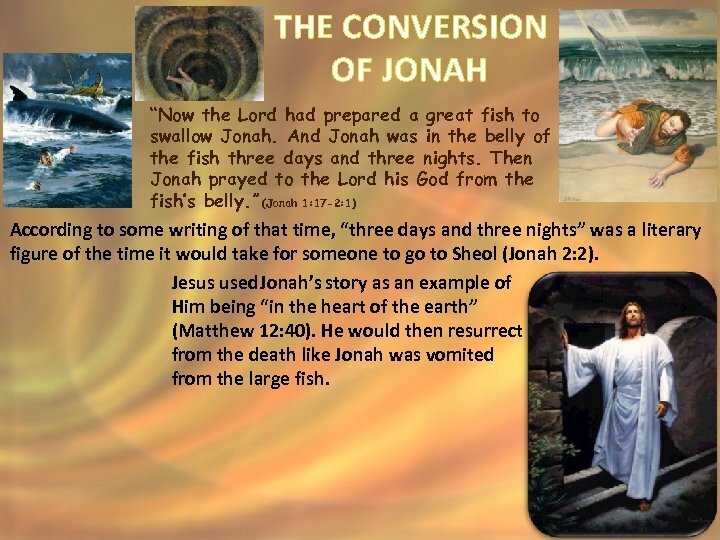 ” (Jonah 1: 17 -2: 1) According to some writing of that time, “three days and three nights” was a literary figure of the time it would take for someone to go to Sheol (Jonah 2: 2). Jesus used Jonah’s story as an example of Him being “in the heart of the earth” (Matthew 12: 40). He would then resurrect from the death like Jonah was vomited from the large fish. THE CONVERSION OF JONAH “Now the Lord had prepared a great fish to swallow Jonah. And Jonah was in the belly of the fish three days and three nights. Then Jonah prayed to the Lord his God from the fish’s belly. 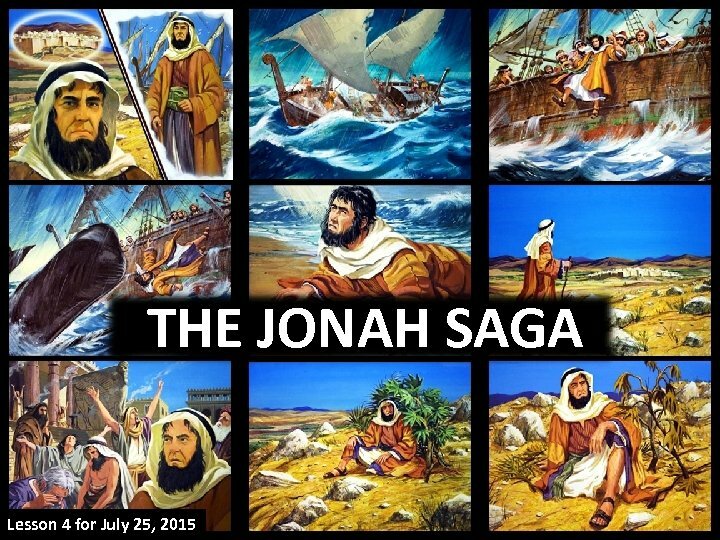 ” (Jonah 1: 17 -2: 1) Jonah faced an imminent death. He trusted God’s forgiveness and he believed God could save him. He repented before Him (Jonah 2: 6 -9). 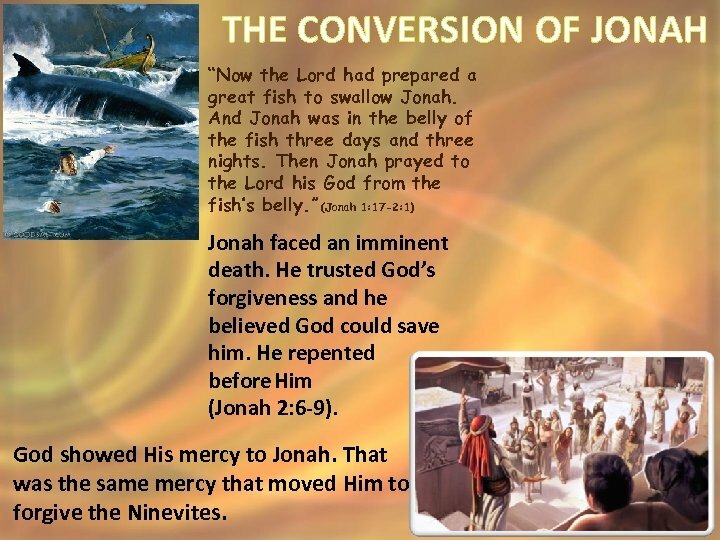 God showed His mercy to Jonah. That was the same mercy that moved Him to forgive the Ninevites. 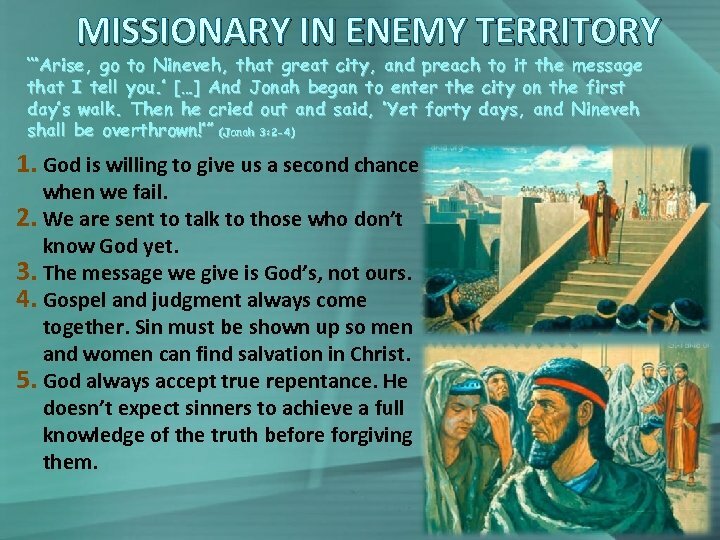 MISSIONARY IN ENEMY TERRITORY “‘Arise, go to Nineveh, that great city, and preach to it the message that I tell you. ’ […] And Jonah began to enter the city on the first day’s walk. Then he cried out and said, ‘Yet forty days, and Nineveh shall be overthrown!’” (Jonah 3: 2 -4) 1. God is willing to give us a second chance when we fail. 2. We are sent to talk to those who don’t know God yet. 3. The message we give is God’s, not ours. 4. Gospel and judgment always come together. Sin must be shown up so men and women can find salvation in Christ. 5. God always accept true repentance. He doesn’t expect sinners to achieve a full knowledge of the truth before forgiving them. THE and said, OF Lord, was not this what I said when CRY ‘Ah, JONAH “So he prayed to the Lord, was still in my country? Therefore I fled previously to Tarshish; for I know that You are a gracious and merciful God, slow to anger and abundant in lovingkindness, One who relents from doing harm. ’”(Jonah 4: 2) Unbelievable! Jonah is the only person in the Bible who accused God of offering grace, of being compassionate, slow to anger and full of love. He complained that God forgives instead of sending calamities. 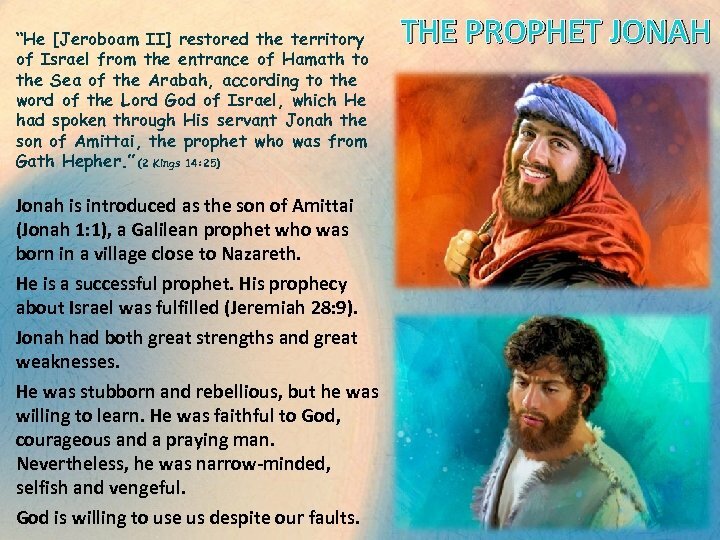 What was Jonah’s problem? His problem was selfishness. 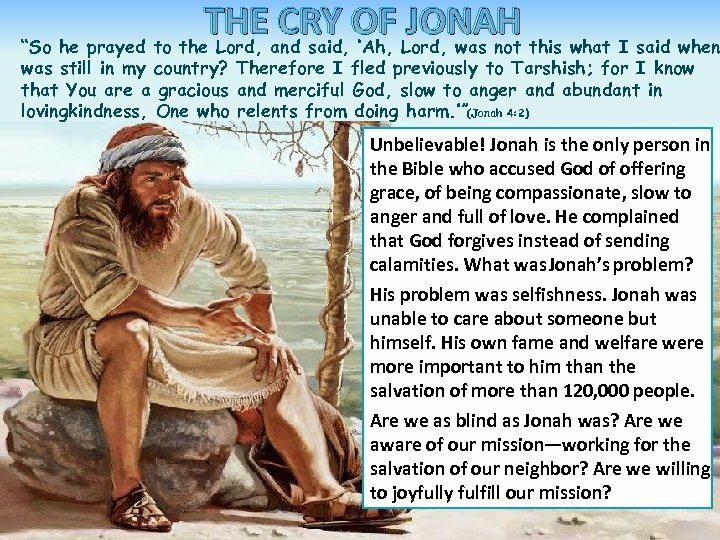 Jonah was unable to care about someone but himself. His own fame and welfare were more important to him than the salvation of more than 120, 000 people. Are we as blind as Jonah was? 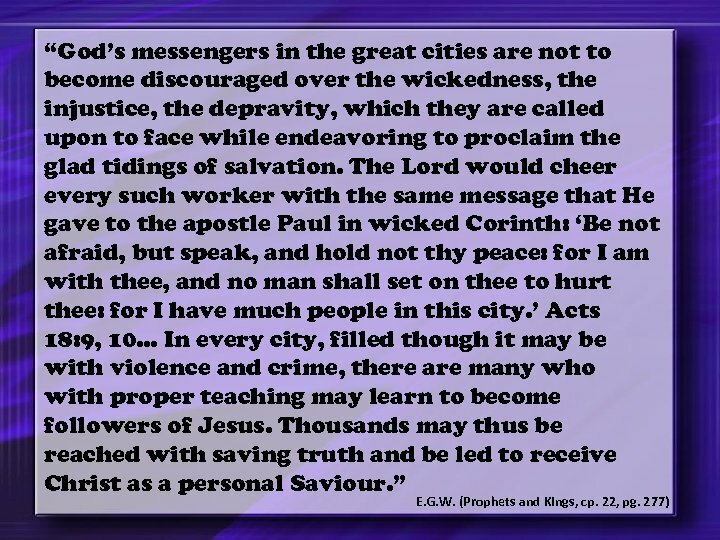 Are we aware of our mission—working for the salvation of our neighbor? Are we willing to joyfully fulfill our mission? 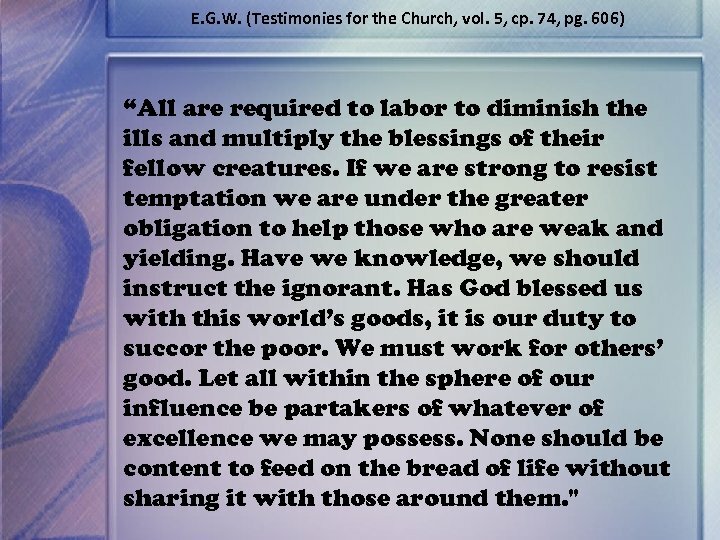 E. G. W. (Testimonies for the Church, vol. 5, cp. 74, pg. 606) “All are required to labor to diminish the ills and multiply the blessings of their fellow creatures. If we are strong to resist temptation we are under the greater obligation to help those who are weak and yielding. Have we knowledge, we should instruct the ignorant. Has God blessed us with this world’s goods, it is our duty to succor the poor. We must work for others’ good. Let all within the sphere of our influence be partakers of whatever of excellence we may possess. None should be content to feed on the bread of life without sharing it with those around them. "